Port Augusta is located 68 kilometres northeast of Iron Knob and 300 kilometres north of Adelaide. In 1802, the English navigator Matthew Flinders first explored Spencer Gulf's northern waters as far north as Redbanks - near present day Port Augusta. In common with other explorers of the time, Flinders explored the Port Augusta area hoping to penetrate the heart of the Australian continent. At the time such expeditions were mounted with the view of discovering a large navigable river or vast inland sea. Flinders was disappointed on both counts however. The legendary inland sea did in fact once exist, but basically Flinders was 120 million years too late. Having discovered no supplies of fresh water in the Port Augusta area Flinders then departed to complete his epic circumnavigation of the Australian continent. By 1852 South Australian colonists had settled in Port Augusta and the town soon became a thriving commercial centre and port, serving the needs of pastoralists in the truly vast hinterlands to the north. For a time wool exports were the mainstay of Port Augusta's economy with many London sailing clippers bearing cargoes to English wool mills. By the 1870s wheat had overtaken wool as Port Augusta's chief export. Early promises of a thriving wheat industry proved illusory however. Rainfall was too unreliable and the area was subject to frequent droughts. The area soon resorted to its previous pastoral activities. 1877 saw the completion of the Overland Telegraph line that linked Australia's eastern states to Perth. In the scheme of things Port Augusta played a crucial role as a major repeater station for the telegraphy network. With the completion of the Indian Pacific railway in 1917 Port Augusta began to assume the role of a pivotal transport hub. Today Port Augusta's unique geographic position sees it as a major service centre for travellers and freight trucks crossing the Nullarbor. 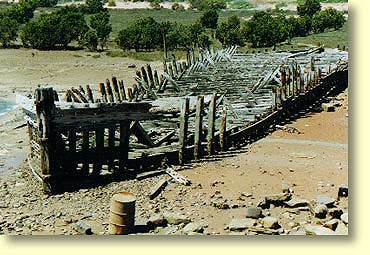 In many respects Port Augusta is also the southern gateway to the Northern Territory. Travellers heading north can do so via the Stuart Highway. An alternate means of transport is to take a more leisurely journey via the "Ghan" rail service which was extended from Alice Springs to Darwin in 2003. During the construction phase of the newly completed Ghan Railway, Port Augusta played a major support role in the development of this landmark project. Just for the record, the Australian Government originally committed itself to completing the Adelaide to Darwin rail link in 1913. At Nullarbor Net we are not great supporters of the current Federal government, however we do congratulate Prime Minister John Howard and his cabinet for its commitment to constructing and completing this long awaited visionary project! Since February 2004 Great Southern Railways has been operating the regular Ghan service linking Adelaide through to Alice Springs, and beyond to Darwin. From the traveler's viewpoint this railway project certainly was a long time coming, but it has been well worth the wait. The newly extended "Ghan" railway line has proven itself to be one of the world's great train journeys. Great Southern Railways also operates the Indian Pacific train service which runs from Sydney and Adeaide, through to Port Augusta, and across the Nullarbor to the Western Australian Goldfieds and Perth. The Indian Pacific train service runs several times a week and we reckon that's definitely travelling the Nullarbor in fine style! Port Augusta is well served by numerous Hotels, Motels, 2 Caravan Parks and 2 Backpacker Hostels. Located on the western outskirts of Port Augusta is the Standpipe Golf Motor Inn. This establishment is one of Port Augusta's newer Motels and caters for the traveller who likes their creature comforts. Phone (08) 8642 4033. Also located on the western side of Port Augusta is the Augusta Westside Motel which offers a quiet beachside location and special weekend rates. For further information please call (08) 8641 0722 or FREECALL 1800 355 125. For the more budget conscious traveler, the Poinsettia Motel is located on the corner of Burgoyne Street and the Eyre Highway. Bookings can be made by phoning (08) 8642 2411. Numerous other Hotels and Motels are available within Port Augusta, including the Acacia Ridge Motor Inn (08) 8642 3377, and the Myoora Motel which can be contacted on (08) 8642 4033. 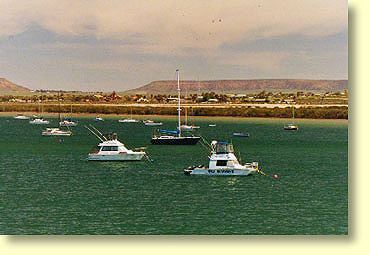 Port Augusta's 2 caravan parks are both located on the western side of Spencer Gulf. Located on the corner of the Eyre Highway and Stokes Terrace is the Port Augusta Big 4 Holiday Park. The Big 4 caravan park offers both powered and unpowered sites, swimming pools, 10 on-site vans, and a number of holiday cabins including one designed for handicapped travellers. Coach camping facilities are also available. The Big 4 Holiday Park does not permit pets. Visitors are advised to arrive before 9 pm. For further information please contact (08) 8642 2974. 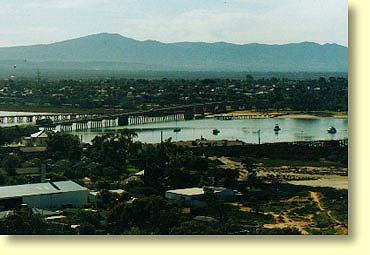 Port Augusta's Shoreline Caravan Park is situated on Gardiner Avenue - right next to Spencer Gulf. The Shoreline Caravan Park offers both powered and unpowered sites, 14 on-site vans, and a number of holiday cabins - including one catering for the needs of disabled people. Pets are permitted on a leash. Visitors are advised to arrive before 9 pm. For further information please telephone (08) 8642 2965. Port Augusta's International Backpackers Hostel is located on 17 Trent Road. The Backpackers International Hostel offers a friendly atmosphere and is located within a few minutes walk of the city centre. For further information please phone (08) 8641 1063. Port Augusta's main shopping district is located on Tassie Street and Commercial Road. Both Coles and Woolworths supermarkets can be found in the area. Woolworths supermarket is open 7-00 am to Midnight Monday to Saturday, and from 7-00 AM to 10-00 PM on Sundays. Competitive fuel prices can be found at Woolworths petrol station. EFTPOS and banking facilities are readily available within Port Augusta. Port Augusta is well served by an extensive network of Bus and Train services that link Australia's eastern states to the Northern Territory and Western Australia. Located on Mackay Street is the Premier Stateliner and Greyhound Bus Terminal. Bus services to and from Adelaide run several times a day, with many services also connecting to Eyre Peninsula towns such as Port Lincoln, Streaky Bay and Ceduna. These destinations may be of interest to the traveler. Other services connect through to Perth, Coober Pedy, Alice Springs and Darwin. For further information, within Port Augusta please phone (08) 8642 5055. For enquiries at Head Office in Adelaide please phone (08) 8415 5555 or Email premstat@premierstateliner.com.au. Premier Stateliner's website is also available at www.premierstateliner.com.au and provides comprehensive details of routes and timetables. Port Augusta's Bus Terminal also displays a range of tourist brochures that may be of interest to backpackers. Very basic showering facilities and a cafeteria are also available within the Bus Terminal. These facilities are available most of the day and night 7 days a week. Port Augusta is well server with an abundance of Roadhouses and fuel outlets on both the eastern and western approaches to town. A favoured rest stop for freight trucks crossing the Nullarbor is the BP Roadhouse located on the eastern outskirts of Port Augusta. The BP Roadhouse has good meals, takeaway food, and excellent shower facilities. EFTPOS is readily accepted here. If your vehicle is in need of mechanical repairs Port Augusta is the place to do them. Spare parts are readily available and prices are competitive - certainly when compared to remote areas of the Nullarbor and outback areas of Central Australia. For emergency road service contact the RAA on (08) 8641 1044. Wadlata Outback Centre is Port Augusta's main tourist information centre. Within the centre are displays covering such themes as the aboriginal dreamtime, early exploration and European settlement of the Port Augusta region, mining activities in South Australia's far north, the Flinder's Ranges and the outback environment. Wadlata Outback Centre is open 9AM - 5 30 PM during the week, and from 10AM - 4 PM on Saturday and Sunday. Wadlata Outback Centre is located on 41 Flinders Terrace - on the south side of the Eyre Highway. For further information contact telephone (08) 8641 9193. 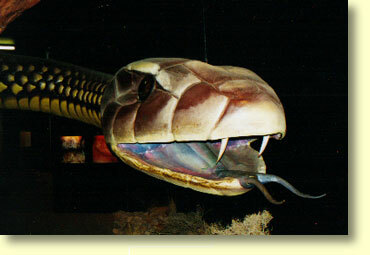 Alternatively view the Wadlata Outback Centre web site or email wadlata@portaugusta.sa.gov.au. 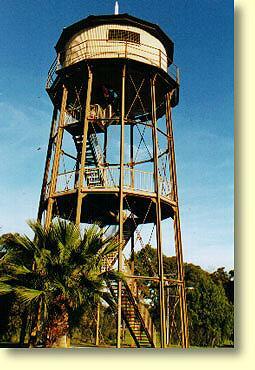 Located on the western side of Spencer Gulf is the Water Tower Lookout. Port Augusta's Water Tower Lookout offers sweeping views to the east, overlooking Spencer Gulf and the town centre. Originally built in 1882, the water tower provided Port Augusta's residents with a gravity fed water supply. The Water Tower Lookout is accessed by turning off the Eyre Highway at Bond Street, and the turning left into Mitchell Street. Don't forget to bring your camera. Port Augusta is also home to the newly created Arid Lands Botanic Garden. For the traveller the Arid Lands Garden displays an unusual mix of native bush and selected plantings of unique desert flora. Native plant enthusiasts will no doubt appreciate Australia's largest collection of Eremophila species. These species of plants are highly adapted to arid areas and are only grown in more temperate areas of australia with great difficulty. Although still in its early stages of development the Arid Lands Botanic Garden will eventually become a major Port Augusta attraction. For further information please Email aridlands@portaugusta.sa.gov.au or telephone (08) 8641 1214. The Arid Lands Botanic Garden is located on the Stuart Highway on the northwestern side of Port Augusta. Open hours are 9 am - 5 pm Monday to Friday, and 10 am - 4 pm on weekends. Also located within Port Augusta is The Royal Flying Doctor Service. Port Augusta is one of 14 Flying Doctor bases that serve the healthcare needs of people living in Australia's Outback. Opening hours for the RFDS are basically from 10AM to 3PM Monday to Friday. Further information can be obtained by telephoning (08) 8642 2044. Port Augusta also runs a School of the Air. This educational facility aims to serve the educational needs of outback children. In the School of the Air two way radio communication serving as an all important medium of instruction for outback school children. To seek further information and arrange a visit just call (08) 8642 2077. For dedicated railway enthusiasts nearby Quorn offers historic train rides several times a week .In recent years the Pichi Richi Railway Preservation Society has been active in restoring locomotives and rail carriages - with some dating from the late 1800s and early 1900s. Train services operated by this society include the Afghan Express, the Pichi Richi Explorer, the Barwell Bull and the Coffee Pot. At present these services operate out of Quorn with some passing through Pichi Richi pass to within a few kilometres of Port Augusta. By the end of 2001 a narrow gauge rail link will be extended all the way from Quorn to Port Augusta. This no doubt will be something to look forward to. If you are driving through Western Australia or South Australia it pays to check on fuel prices. In remote areas such as the Nullarbor prices can be upto 30% dearer than in Australian capital cities. Nullarbor Net recommends travellers view ExplorOz's fuel price pages for South Australia and Western Australia. ExplorOz's price update facility can also be used to inform other travellers of the latest changes in petrol, diesel and LPG prices. If you will be driving within Western Australia Fuel Watch also has an excellent and regularly updated website covering prices in metropolitan and country areas of the state.